These thick, soft and chewy gluten free red velvet chocolate chip cookies have just the right red velvet taste in a portable cookie form—with the ease of a drop cookie. Celebrate the season! Red velvet is one of those things that tends to evoke lots of strong opinions. Even though it’s true that the original red velvet cakes were just slightly red-tinged because of the hint of cocoa powder (it’s not really a super chocolate cake), I like mine really red. Ruby red. It doesn’t change the taste, of course (because that would be gross), but it does change my eating experience. If you don’t want/can’t have the food coloring? Leave it out. These gluten free red velvet chocolate chip cookies are based on my recipe for gluten free soft batch CCCs, but—I’m gonna say it—better. And, of course, since they’re soft batch, they really do taste like they’re just right out of the oven. But without the ooey gooeyness. I like my cookies to stay together, and cookies that are actually right out of the oven? They don’t do that. For the rest of us, let’s talk about which food coloring to use and when. I rarely use anything other than gel food coloring, which is a concentrated food coloring in gel form. Using gel food coloring means that you never have to add so much of the stuff that it changes the chemistry—and taste—of your baked goods. The most widely available brand of gel food coloring where I live is Wilton brand, but Wilton’s food corloings are not reliably gluten free. My favorite brand of gluten free food coloring is AmeriColor brand. It’s not cheap, but gel food coloring lasts a long, long time. AmeriColor is sold in some kitchen supply stores and even fewer craft stores, so I buy it online. I like this Americolor kit best (that’s an affiliate link) for a few reasons. First, that kit has great basic colors like blue, red, yellow and green. Second, the bottles are small, but they have a flip top that allows you to squeeze the coloring out in small amounts. If you purchase the colors that come in bottles with screw-on lids, you will get the color everywhere each time you use it. Please keep in mind that food coloring fades during baking. You want the color of your raw batter or dough to be brighter than the way you’d like your ultimate baked goods. Try your best to mix the coloring into the wet ingredients before incorporating everything into the dry ingredients, and you won’t have streaks of color in the cookies. There’s no need to mix the wet ingredients separately, though, before mixing them into the dry. If you watch the video, you’ll see what I mean. Team chewy, or team crispy chocolate chip cookies? I love all cookies. I do not discriminate. But normally my love language is a super crispy cookie. Crispy cookies become crispy because of the balance of flour-sugar-eggs-vanilla ingredients in the recipe. But also because they’re allowed to brown at a low oven temperature and very slowly. But red velvet cookies aren’t going to be red if they are crispy, not without adding so much food coloring that you’re bound to taste it (and not in a good way). The intense browning would lead to a very faded red color otherwise. 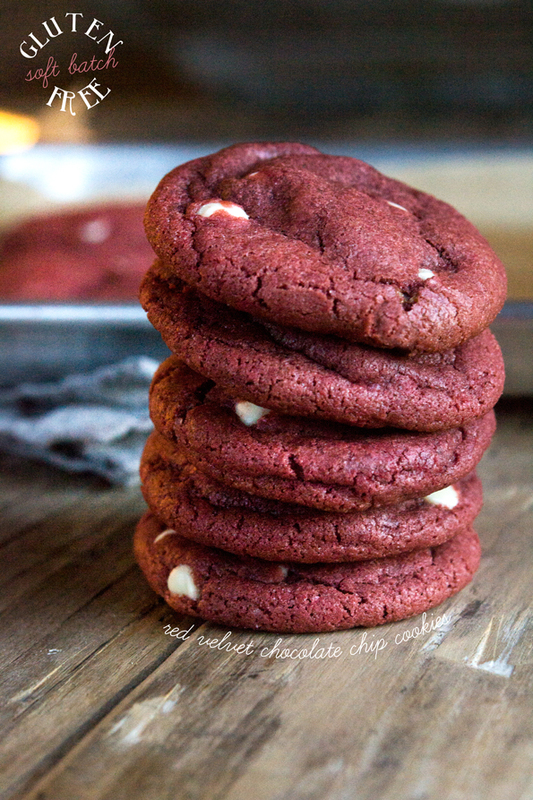 That’s why red velvet cookies are best made super thick like these soft batch-style cookies. They’re also lovely as red velvet crinkle cookies, which are a family favorite, too. 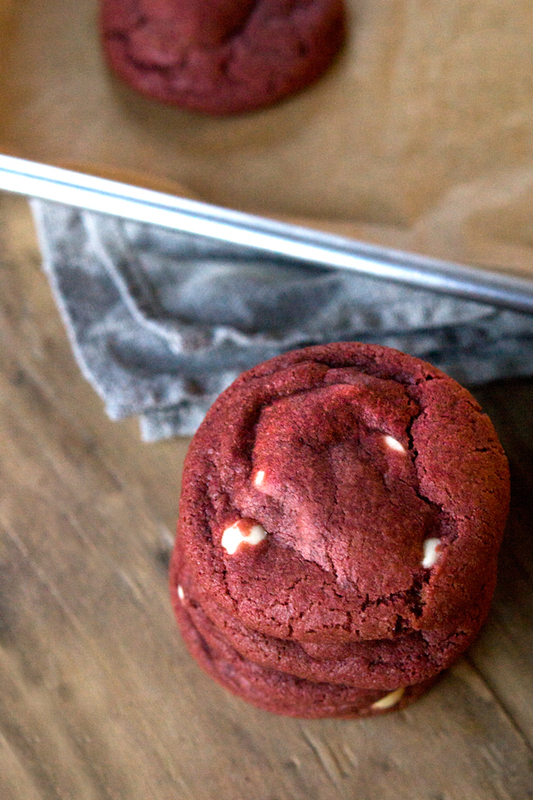 If you normally don’t like soft and chewy cookies, or maybe you’re all about the crispy on the outside, chewy inside like our Mrs. Fields chocolate chip cookies, you really should still give these red velvet cookies a try. They’re like the chocolate cookie for vanilla lovers like my son—and they just look so impressive on a holiday table. Dairy-free: In place of the butter in this recipe, you can try using Earth Balance buttery sticks. They contain quite a bit more moisture than butter, though, so your cookies will likely spread more than mine. If you can’t find dairy-free white chocolate chips, just use dairy-free semi-sweet or dark chocolate chips. Egg-free: In place of the whole egg, you can try using a “chia egg” (1 tablespoon ground white chia seeds + 1 tablespoon lukewarm water, mixed and allowed to gel), but the egg yolk is a bit more difficult to replace. You can try adding one more tablespoon of unsalted butter in place of the egg yolk, as it’s there to tenderize the cookies. Corn-free: This one’s easy! In place of cornstarch, you can use arrowroot. Vinegar: In place of apple cider vinegar you can use white wine or white balsamic vinegar. All set to make these cookies (GF Red Velvet Chocolate Chip Cookies) and realized I don’t have the vegetable shortening, can it be replaced with coconut oil or salted butter? Equal amounts? Hi, Deb, I’m afraid you won’t get the same texture with anything other than shortening. Butter has a significant amount of water, which causes the cookies to spread, so I don’t recommend using it to replace the shortening. You can try coconut oil, but the cookies will spread more as well. Thank you for the red velvet chocolate chip cookie recipe. It looks great. I can’t wait to try it out. While you are making these gluten free cookies, is there any chance you can make them eggless as well? Hi, Aneesha, please see the “Ingredients and substitutions” section for advice on making these cookies without other allergens. What is the consistency of the batter supposed to be? I tried making these and it felt like something was missing (like another liquid, or another egg or something…). It wasn’t like regular cookie dough at all, it was really crumbly and didn’t stay together. Is it supposed to be like that? And I couldn’t get mine to turn red at all with the food coloring. Nothing is missing from the recipe, April. The 11 total tablespoons of shortening and butter, plus the egg and egg yolk, provide plenty of moisture. My guess is that either your ingredients were not at room temperature when you made the recipe (fats will not properly incorporate into dry ingredients if they are not at room temperature, or that you used a flour blend that is too high in starch. As for the food coloring, as stated in the recipe, you need to use a gel food coloring. Those are pretty potent, and don’t change the chemistry of the recipe. Good luck! Scratch the questions about Better Batter, it’s listed that you used it. First, thanks so much for this great recipe. My daughter loves red velvet anything and her birthday is in a week. We’ve been trying to figure out what to make her. Now, here is where I tell you how I completely altered your perfect recipe. While I’m highly gluten intolerant, my daughter has severe fructose malabsorption with mild gluten intolerance. She can’t have wheat (rye or barley either) because of the fructans in them. The gluten she could probably tolerate in some moderation. My daughter can’t have brown sugar since molasses is a huge no-no. We bake mostly with dextrose and not sugar (since it is half fructose), but small amounts of pure cane sugar are tolerable. So, I did 1/2 cup of cane sugar, and 2/3 cup of dextrose. I had to up the liquid content in the recipe because dextrose absorbs more than sugar. So, 8 tbsp of butter and 2 tsp of water. She also can’t have the apple cider vinegar (nothing apple.. ever), so I used rice vinegar. I used unsweetened 100% cacao baking chocolate cut into pieces. And.. the big kicker.. she can’t have gel food coloring (corn syrup), so we just went without the coloring. I’m sure it tastes entirely different than you planned, but it is wonderful to us. We will probably try it with dark chocolate chips next time, since she can’t have milk chocolate at all, not even semi-sweet. Still, these cookies aren’t lasting long and she has hit her sugar load for the day just on the cookies. My daughter also wants me to try making it into a cookie cake for her actual birthday. We’ll see how that works out. At any rate, thank you very much for the wonderful recipe. Most recipes don’t survive our modifications very well at all. I’m not good at developing recipes and barely competent at altering them. We depend so much on your GF recipes for our food. What happens if the eggs aren’t at room temperature? Hi Janelle — I’ll jump in here and say that they need to be at room temperature because it makes a difference. Cookies are very sensitive! I am a terrible cookie baker, but when I follow Nicole’s directions, I have much better luck. The good news is that you can bring eggs to room temperature pretty fast by putting them in a cup of warm water for a few minutes, while you are getting everything else ready. Hope that helps! My family loved (and inhaled) the soft batch chic chip cookies, and I know they will love these, too. Great idea! Just spoke with Larry at Montana’s Gifts of Nature and ordered my Expandex. He is a delightful man! Have you ever used their GF flour blend? It appears to be cheaper and includes Xantham Gum. Hi, Mare, Glad you got in touch with Larry. Yes, he’s a great guy. I have not tried their all purpose gluten free flour blend, but it has chickpea flour and is not at all like the blends that I use and recommend. It might be a very nice blend, but I’m afraid I don’t recommend it for my recipes. Sorry! Yeah, not a fan of pea flour either. Oh well. I’m afraid that you can’t substitute anything for the brown sugar and granulated sugar in this recipe and get a comparable result. If you are looking to bake without refined sugars, I’d take a look at my Paleo recipes. apparently you can read minds I have been looking for this recipe but could only find ones that had cream cheese in them. No, you totally can read minds. These look amazing and my SIL is obsessed with red velvet. Paleo recipes might work for you, Gaylene, except for the egg-free thing. Vegan Paleo is not easy! I’m afraid I don’t, Kristin. Sorry! Of course these look sooo yummy and they will be perfect for our next holiday that will come upon us!! So festive! It turned out SUPER fab and it is soooo yummy. Everyone raved about it at our “Brinner” (breakfast for dinner) last night.